Is Blackberry looking at the wrong end of the market? Continued from an earlier post: Why am I so deeply sceptical of BB10 as RIM’s comeback kid? The Smartphone sector looks to be one of the most extreme oligopolies of the 21st century- even while the market is exploding at 35% YoY (700 million in 2012 versus 490.5 million in 2011) – there is little room left for any one but Android and Apple. Apple and Android contribute to 92% of the Industry Volume and 102% of the Industry profits! All others combined for 8% of the market volumes but were edged out of the profits – leaving little space for investments into devices and the markets. The thing about market share is that it is liable to change rapidly in a rapidly growing market.However, with the base of 700 million it is possible that growth rate would have topped out. On the other hand, North Americas and Europe are visibly saturated in volumes/and growth is slowing down; and with maturity are only driving Revenues and profits as people tend to purchase more high-end smartphones, including the more expensive Android variants and the iPhone. 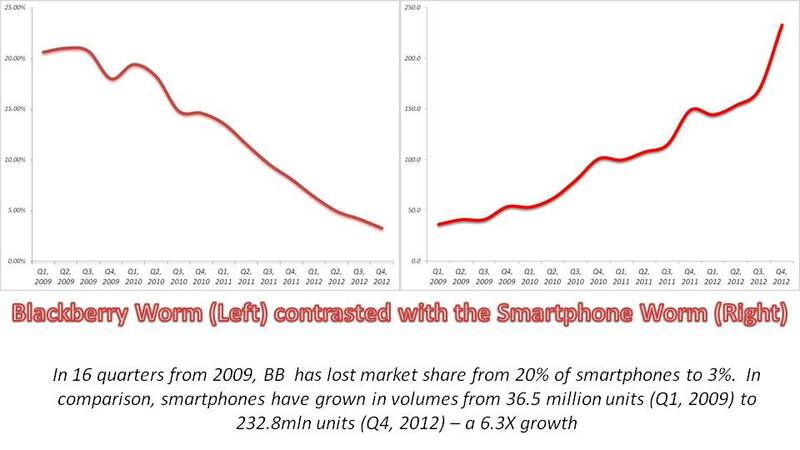 On the other hand, the smartphone market is growing super because Android is powering the low end of the market. These markets are typically the South East Asian regions, Indian subcontinent, China and Africa. Even while Blackberry has a strong presence in nations like India, it is the Android army that it has to content with in such markets – and currently Blackberry’s portfolio in the low end is only based on the 4 year old Blackberry Curve which is appearing a little jaded and last generation. Thus Blackberry really needs to be focussing on low end innovation, pricing, volumes and markets – currently there is no visibility of it doing this. Hopefully it gets its act together before its too late. A flagship device is one thing – numbers, profits, revenues is quite another. 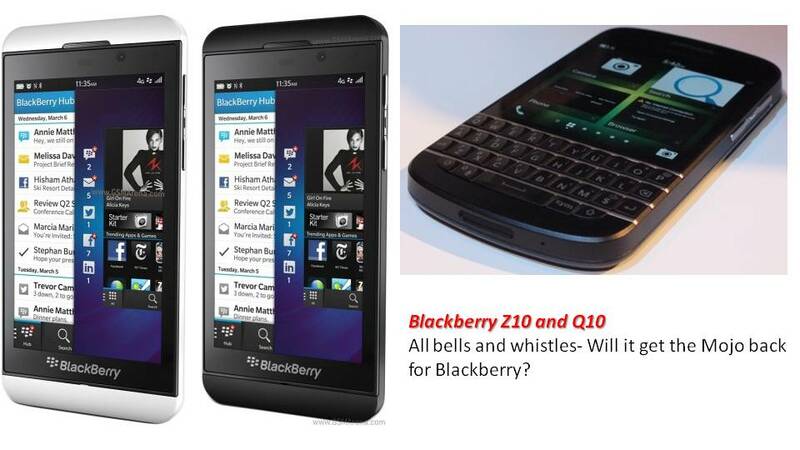 Why am I so deeply sceptical of BB10 as RIM’s comeback kid? Without a shred of doubt, the BB Z10 is a great device – and RIM has exceeded itself in making the comeback device which is in equivalence of Samsung SIII & Apple iPhone5 & Nokia Lumia 920. But device parity, 70k apps & new UI OS just ain’t cutting it- BB needed something remarkable to break thru Android & Apple clutter. In so far as i see it, BB Z10 ain’t magical to break the clutter. Or so it seems? Its a great comeback effort for BB – for now Z10 may keep them from going out of contention – & that is what BB wanted Z10 to do for it. The Blackberry 10 touts apps such as Timeshift, Flow & Peak, Predictive Keyboard and the Hub. Yes, they are all good- but for the users of apps- this list is perhaps jaded. Its a couple of years old. How the device does it is the key – but hey! i dont see the novelty in here. On numbers compre this with 650K (or whereabouts) Apps on Apple or Android. The key here was the app moving beyond the device – to perhaps some other device – a tablet integration, a TV integration, a Car Dashboard integration. Blackberry is only at step 1 and Apple/Android are halfway about a couple of stories ahead. I cant still talk to the Blackberry for instance!The bare-bones maps app and a deficit of camera features are two examples where BB has a lot of distance to cover. The slick video of BB10 OS make a great selling point and theres no denying that – but it looks to be a little late in the day – Screen Share, Remember, WebEx, Share et all! In my opinion, BB10,Z10 and Q10 give that little space, that little breather and that little Oxygen that Blackberry needed to survive. 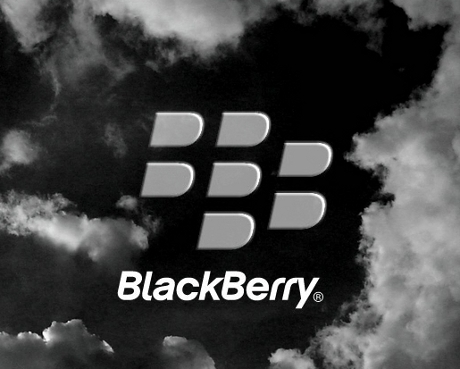 With a few good operator tie ups- Blackberry has fixed the short term – only to rebuild for the longer wars ahead. RIM has eroded 80% of its m-cap in the last 3 years and its product line has wilted under relentless attacks from Apple and Android. Research In Motion Ltd. has declined below book value for the first time in nine years leaving the BlackBerry maker worth less than the net value of its property, patents and other assets in a sign of investors’ lowered faith.This follows Blackberry’s losses in the U.S. smartphone market share. Blackberry Market share sank to 9.2 percent in Q3, 2011 from 24 percent a year earlier as consumers opted for Apple’s iPhone and Android phones from Samsung Electronics Co. and HTC, according to research firm Canalys. 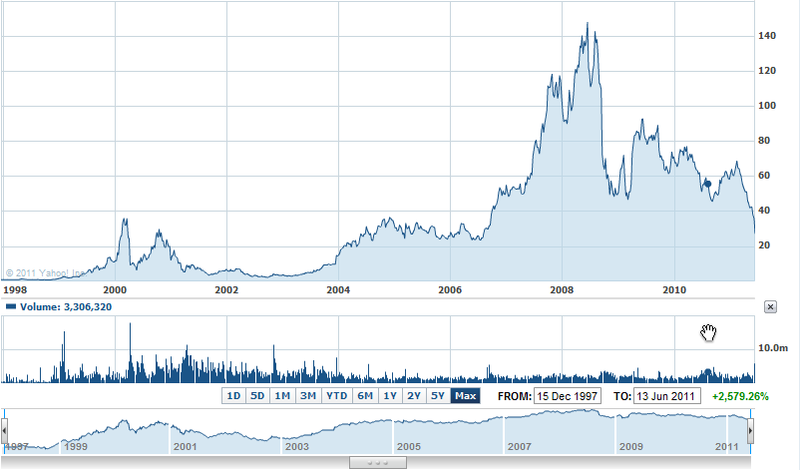 This leaves Blackberry with a $9.82 bn market cap and a prime subject for acquistion if so be be desired. Canalys has stated the obvious in terms of smartphone platform market shares: Android rules and has captured 48% of the smartphone market in Q2 of 2011. Smartphone adoption continues to grow rapidly across the world, reaching a total of 107.7 million units shipped in Q2 of 2011, a 73% year-on-year growth.Android was the biggest driver of smartphone shipments in Q2, as Android-based smartphone shipments were up 379% year-over-year, coming in at 51.9 million total units shipped.Successful Android-based products from vendors such as Samsung, HTC, LG, Motorola, Sony Ericsson, ZTE and Huawei, as a catalyst for the platform’s growth. As written about earlier Apple has over-shot Apple and is the No.2 smartphone platform. Android’s growth has powered Samsung as the No.2 smartphone maker globally. Android was the number one platform in 35 of the 56 countries Canalys tracks, resulting in a market share of 48 percent. Nokia’s leadership position has proved most resilient in key emerging markets, and it still leads in the BRIC countries: Brazil, Russia, India and China. The problem for Nokia is that demand for its Symbian-based smart phones has dissipated very rapidly, particularly in operator-led markets, such as Western Europe, where it’s been strong in the past. It badly needs the first of its Windows Phone devices to launch as soon as possible to arrest a decline and, hopefully, silence its critics.Even while Nokia-WP tie-up was announced in February, the first of these devices will be launched only towards end of 2011.Nokia is set to have several more difficult quarters before a possible reversal of fortunes. RIM had a challenging quarter in North America, with its market share slipping to 12%, down from 33% a year ago. However, Blackberry continues to see significant interest and uptake of its devices, for example in Indonesia and South Africa where it is the leading smart phone vendor. 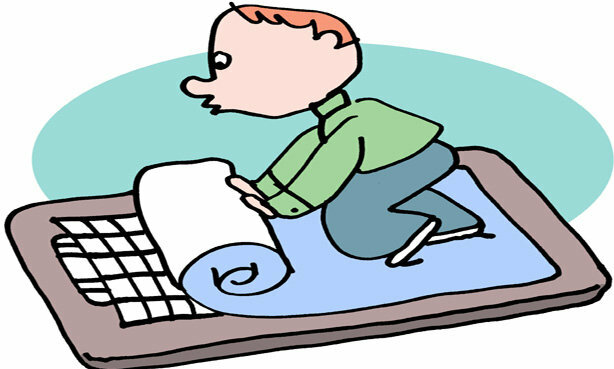 Nonetheless, it must continue to innovative and recapture lost momentum. It’s critical that the next-generation BlackBerry OS 7-based products launch ahead of the upcoming holiday season to compete in the market. So what then are the choices that RIM has? Blackberry has to do a fundamental re-think of its device portfolio. In an age where push email takes a back seat to navigating by swiping on the screen, streaming rich video on a phone, and perusing application stores with tens of thousands, and even hundreds of thousands, of apps, RIM finds its device has been knocked clear of the limelight. The Bold didn’t work and the Torch didn’t light up sales either. the Blackberry Playbook also isn’t as refreshing. In an age where Apple and Android have been leading by innovation, BB is increasingly seen as a One trick pony. Interestingly, quite a lot of other factors paint a completely different picture of BB. Revenue is nearly triple where it was in early 2008 and profits are up 250% from the same time period. They are gaining distribution as they move into new markets as well. This looks like a company on the rise with a bright future. On the other hand, Market share is down, the Playbook launch hasn’t been noteworthy, and the company is planning layoffs. RIM has to see thru the dichotomy clearly. While RIM still has good sales today, it finds itself more closely identified with HP’s webOS, Windows Phone 7, and Nokia, in that the world passed it by and now it’s trying to catch up. It may have stuck with the current platform too long though, thinking that rising revenues and profits meant it was on right path. Recently announced measures may be too little, too late. Continued from earlier posts about the Blackberry slide. Read the posts: Part I, Part 2 and Part 3. Apple and Android are squeezing and muscling Nokia and Blackberry out in the war of platforms/smartphones. Earlier this month Nokia sounded its profit warning and was unable to put a number to its quarter earnings through the rest of the year. Blackberry followed suit after it reported earnings of $695 million on sales of $4.9 billion compared to financial analyst estimates of $5.15 billion in sales. RIM shipped 13.2 million phones. Shares for the company fell nearly 23 percent to $27.19 (Contrast this with $140 share price in 2008). RIM now expects to make a EPS of $5.5-6 against an expected $7.This current second quarter, which ends in August, will showcase the continuing decline for RIM. The company is calling for sales of $4.2 billion to $4.8 billion. 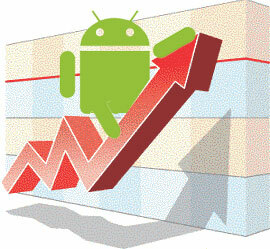 According to ComScore, Android commands 36 percent market share, with Apple’s iPhone grabbing 26 percent. RIM is at 23 percent and falling.The shortfall in the United States is primarily related to the age of the BlackBerry portfolio. Android faces a pincer tong attack by Apple at the the top end of its portfolio and by cheap Androids at the bottom end of the portfolio. Even when BB believes that its OS7.0 will be instrumental in turning the course, analysts and geek boys dont give BB a chance against iOS and Android. Product delays and overhead/headcount cuts are having a deleterious effect on RIM’s forthcoming QNX-based super smartphones intended to give the iPhone and Android handsets stiff competition.While new products in the fall should help,they will not be enough to stabilize share loss vs. faster moving competitors. 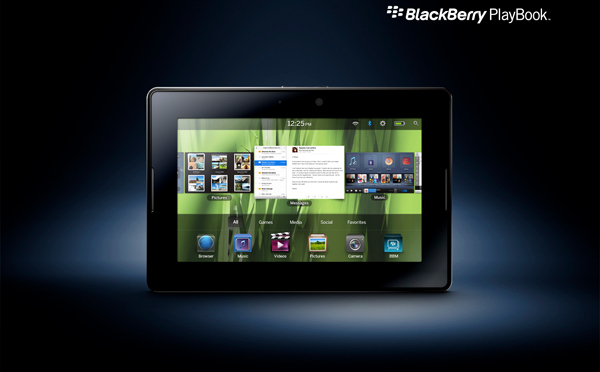 RIM’s new BB Playbook has not cut the ice with the iPad fan-boys and is not expected to enthuse and excite unless RIM initiates huge price corrections which will impact the bottom-lines in a negative manner. Contemporary OS and interface apart, BB has another couple of things to be worried about majorly in 2011. The lack of a 4G Handset to complement 4G launches happening across operators in US and the handicaps in Playbook, its tablet. The problem for BB doesnot just stop at the BlackBerry smartphone platform, their OS quagmire and how it competes with Droids and iPhones. 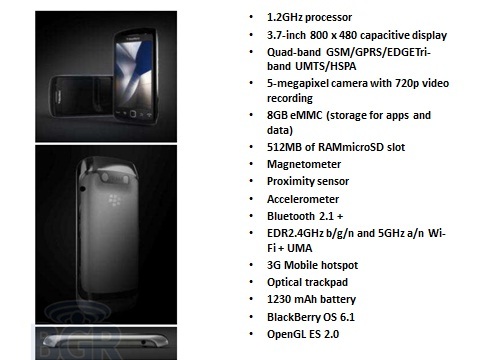 While iPhone 4 and Droids/EVOs exhibit capability of 4G which would hence complement the LTE rolls outs that operators are investing in, LTE Blackberry phone is still in a very early development process. Lack of an imminent BB LTE offering in 4G space, which is expected to drive enterprise business and adoption could provide the opening for the Androids and iPhones to penetrate such markets and get a head start over BB. •	The current SDK doesnot do a lot of developer stuff. Hence developers would have to wait for a date closer to launch for platform readiness. That delays the developer bit. •	Secondly, the Playbook would launch after the launch of Android 3.0 and iPad 2, both second generation tablets which means more refined behavior and lesser glitches. •	Thirdly, it doesn’t help that the PlayBook absolutely requires a BlackBerry to be wirelessly tethered to it in order to do native enterprise email. A BlackBerry smartphone tethered to the PlayBook for required email support is practically a boat anchor. RIM’s challenge now is to keep delivering on the needs of the enterprise while at the same time packing the BlackBerry with the sexiest features that will truly drive end-user interest. If it doesn’t do this well, RIM is likely to lose share and ultimately become no more than a footnote in the mobile market that it helped create and define a decade ago. While the earlier post, was a study in factors that led to the slide in BB, this post examines the efforts made by BB towards a more consumer centric product approach. While Torch was BB’s best effort till date at consumers, BB’s consumer technology compares poorly to other companies’ end-user-focused devices. RIM’s application marketplace trails Android and iOS by several orders of magnitude, and the overall consumer experience is far less polished than the competition. RIM must find ways to evolve its platform to be more competitive with changing user needs. While recent acquisitions show that RIM is slowly picking up some of the parts that it needs, such as a new kernel and better Web technology, it will need to accelerate the process of integrating those features into a new operating system — as well as a more coherent marketing campaign to better explain RIM’s offerings. To that extent, the QNX OS that BB has introduced in its Playbook tablet is somewhat at par with the expectations in the market. It had to be because tablets are quintessential consumer devices. BB stepping into this space may give the category some shades of enterprise. 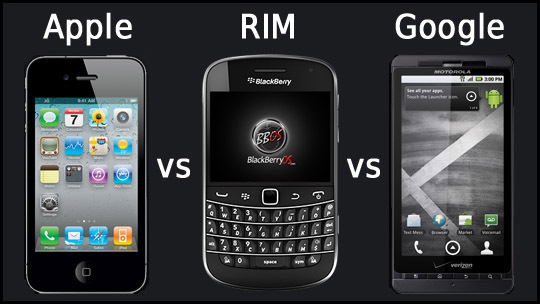 Ideally, RIM needs to transition to a new platform entirely rather than attempt to evolve its current offerings. If a modern platform suddenly became available for sale that RIM could use to leverage its core strength, while providing new features, it would be wise to become a bidder. Otherwise, the BlackBerry might become a bit of nostalgia, eclipsed by later entries that were more capable for today’s growing needs. 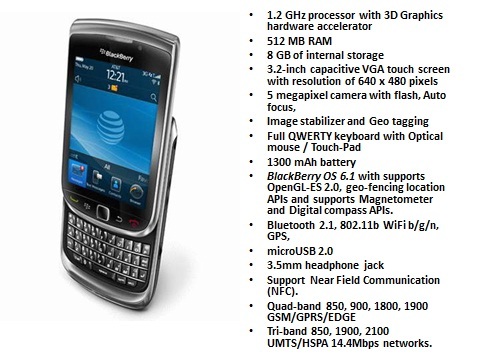 The leaked out features and specs of the 2011 Blackberry, which include the Bold 3 and the Torch 2 have been pretty average on specs and BB 6.0 OS has not really taken the thunder out of the iOS and Android numbers. The No 1 smartphone company in US is getting sidelined by competitors who are innovating better and more engaging products for the BB consumers. 2011 may see BB loose the balance to competition in a way that it may never come back into reckoning again. In an earlier post, i had written about the 5 reasons responsible for the BB slide. Blackberry under pressure: Gartner report shows that while Blackberry has grown over 30% YoY, its still is loosing relevance in the market courtesy Android and iPhone! RIM is under pressure and it not only about loosing the grip on enterprise solutions, where it continues to be the king though. RIM faces pressure of getting side lined by emergence of categories and consumption patterns that it was not bothered about till a few quarters back. BlackBerries forever, were known for one thing: instant access to push e-mail and the ability to sync your in-box with your corporate mail, on the go. Over the years, RIM has added calendar and contact sync, Web browsing, color and touch screens. At the heart, though, is the power of push e-mail. The BlackBerry thus remained a one-trick pony, but it does that trick extremely well. Unfortunately, relying on that trick is not going to be enough to keep RIM relevant in the market going forward. The problem for RIM is that others have learned to do that trick as well. It took some time, but now Microsoft’s platforms offer tight integration directly to Exchange, which remains the corporate standard for e-mail. In addition, by licensing the Exchange ActiveSync protocol, Microsoft has given vendors such as Nokia, Palm, Apple and others the ability to offer that core wireless personal information management functionality. So the move has been from RIM’s best-of-breed management capabilities, tight security and encryption, and the ability to integrate into scores of business applications to touch screens and multi-touch gestures, photo tagging and cataloguing, media and music synchronization, and the integration of social networks. From Enterprise to the consumer underscoring a very important point: When it comes to mobile, it’s not necessarily what IT thinks is important; it’s what the end user thinks. So, while RIM has all enterprise features on its side, end users are starting to demand the sorts of smartphone features they can find on new and flashy devices that run iOS and Android, putting pressure on IT to allow those devices into the organization as a corporate standard. Apple and Google, while wooing the mass market, have made huge strides in adding more business-required support, positioning them-selves to capture the hearts and minds of both the business user and the consumer, who in many cases are one and the same. Users’ mobile expectations have evolved. Communication is still what consumers want most from a mobile device, but now they expect the ability to reference information, browse the Web, consume entertainment and play games. It’s with these functions that RIM’s platform starts to severely show its age. BBs browser and app store experience is pathetic and I could seriously vouch for that, now that I carry an enterprise BB on me.